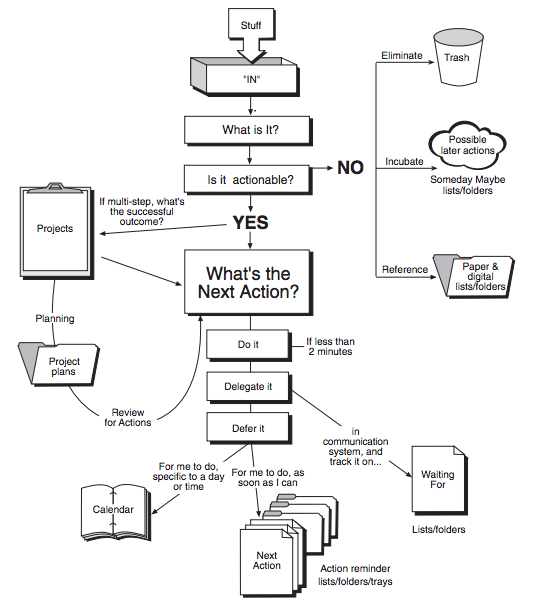 “Getting things done” by David Allen is a framework for organizing and tracking your tasks and projects. We all suffer from problems in time-management, procrastination, overwhelm and stress. This book has a system to solve most of these problems. 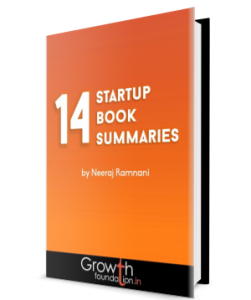 The simplicity and effectiveness of ideas in this book has made it a bestseller. A person is the most productive (and creative) when his or her mind is clear, free of what the author calls “open loops” — the things people commit to do which remain undone and become a drag on the unconscious mind. This is much worse because most of the time, we commit our “tasks” to memory—“remember to call Ritesh”, “don’t forget to bring the milk” – we bombard our minds with such tasks and put them to memory. This clutters our minds which have to constantly remind us of these tasks. The author recommends creating a system to pull-out ideas/tasks from your mind and writing it down on paper or your computer in a system which will timely remind you of it.Thus the whole task of “time management” is really to keep the mind clear of distractions so that we can do what we’re doing with full focus and attention. Collection Stage: your first task is to gather all the items on your “to-do” list that remain to be completed. This could be done on an electronic or paper-based note-taking system. The important thing is every incomplete task in your head should be in your collection system and out of your head. And also, you must empty the collection buckets regularly. If not, trash it, or put it in an appropriate file. The author also recommends having a “bucket list” to put ideas or actions you could take someday (maybe), but are not going to take soon. If yes, what’s the next action? Will next action take less than 2 minutes? If no, delegate or defer it. If it takes longer than 2 minutes, consider it a project. Organize stage: Allen describes eight categories of reminders and materials: trash, incubation tools, reference storage, list of projects, storage or files for project plans and materials, a calendar, a list of reminders of next actions, and a list of reminders of things you’re waiting for. Review Stage: A review of your system and lists, preferably weekly, is critical for this system to work. Doing Stage: In the end, you’re left with a pile of “next actions” to take – your actual, real work, which you can do distraction-free. There are four criteria for deciding which task to do next: context, time available, energy available, and priority. Defining purpose and principles: Why are you doing this? Outcome visioning: What are you doing? Brainstorming: How will you be doing it? Organizing: What are the big pieces of tasks that will get you from here to there? Identifying next actions: The final step, get started!When a project is too big to swallow in one swoop, use this process to break it down. The key to sustaining the system is the Weekly Review. This process includes whatever is needed to empty one’s head and includes going through the five phases of workflow management. Allen recommends blocking out a couple of hours early every Friday afternoon. Collection habit will ensure that you don’t clutter your subconscious mind with small pending tasks, allowing you to focus entirely on the task at hand. The next-action decision will empower you to realize that there’s something you can do, to move towards your targets. It removes clutter of useless distractions. Outcome focus: The author lauds the ability to envision success even when how to achieve it is unclear. Being able to generate lots of ideas, honing and organizing them, and executing them, is a necessary mental discipline for success. While going through your tasks, if something takes less than 2 minutes, DO IT! Don’t try to remember tasks. Instead use a system where you can dump it into a journal or a software and forget about it. This applies to big project ideas you could put in the “someday/maybe” bucket list. Effective project management means setting up systems that allow you to give undivided attention to your current activity.